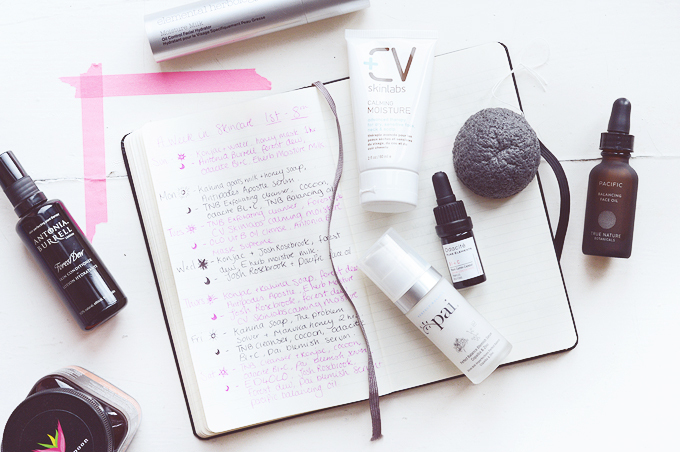 It was exactly one year ago today that I published my last 'week in skincare' diary. I promise I didn't plan it this way but it's pretty cool it's worked out like this. If you want to catch up I posted my first skincare diary back in 2013 here (pre-green), and then followed up in 2014 (post-green) with an update here. 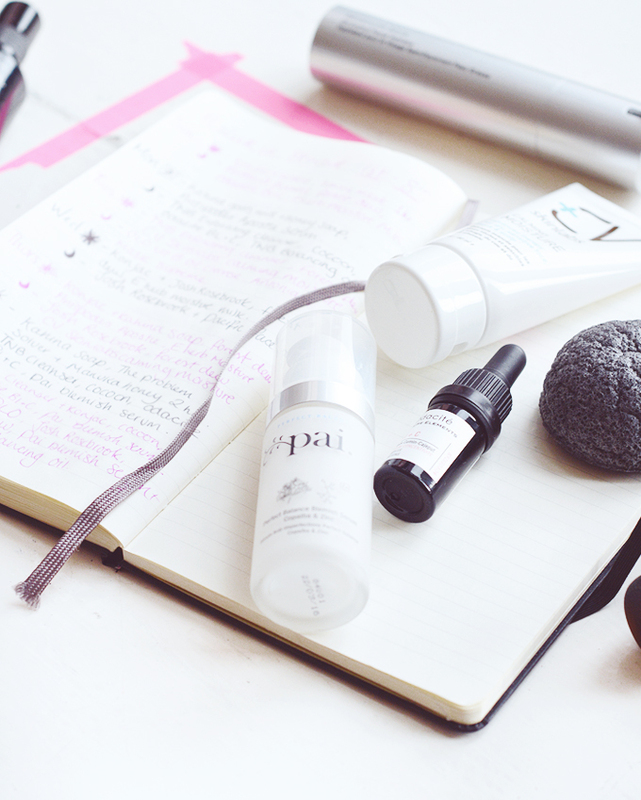 A quick look back one year ago and the products I was using.. there were some really great bits, including the Pai balance moisturiser and Therapi toner, both of which I'd happily repurchase if I was to ever run out of anything. Only one product has lasted me a whole year though, May Lindstrom's The Clean Dirt, this little beauty is still going strong in my stash thanks to its powder formula. I've used about half of the bottle in the past year so still have plenty to keep me going. This years 'A week in skincare' is from the 1st-8th of this month, as we all know me & my problem skin aren't the best of friends right now so I've been flitting about from product to product while I try and decide what works the best for me. I know that my skincare isn't the problem so I don't really have an issue using all of these things, in fact in the 10 days since finishing this diary I've noticed an improvement in my skin, though I think that may be from some hormone-balancing supplements I'm now taking! AM: Charcoal konjac sponge + water, Manuka Honey mask for 1 hour then a makeup & skincare free day. PM: Konjac + water, Antonia Burrell Forest Dew, Odacite Bl+C serum, Elemental Herbology Moisture Milk. AM: Kahina Goats Milk & Honey Soap, Antipodes Apostle Serum. I can't remember exactly what I was doing on these two days but I think I was home and decided to give my skin a break during the day, using the bare minimum to let my skin have a nice calm day. I never feel the need to use anything on my skin after using a honey mask as it feels so soft and perfectly moisturised anyway. I then used some treatment products at night to aid in healing and repairing. AM: TNB Exfoliating Cleanser, Antonia Burrell Forest Dew, CV Skinlabs Calming Moisture. PM: One Love Organics x Elizabeth Dehn Vitamin B Cleansing Oil, Antonia Burrell 7-in-1 Mask Supreme. I used the very last of my Antonia Burrell mask here and left it on overnight. I wiped my skin with a cotton pad and a little toner to remove most of the clay before bed though (I read you could leave this on overnight but didn't want to end up with clay on my pillow!). The results were a-okay but I still prefer this as a mask to use in the morning - it's perfect to wake up skin without leaving it red and irritated. AM: Konjac sponge + Josh Rosebrook Moisturising Cleanser, Forest Dew, Eherb Moisture Milk. AM: Konjac + Kahina Soap, Forest Dew, Antipodes Apostle Serum, Eherb Moisture Milk. I don't think I've mentioned the Josh Rosebrook Moisturising Cleanser yet but I super-duper love it, it has a light jelly/honey consistency, smells amazing, feels soothing and leaves my skin calm. I will review it soon! AM: Kahina Soap, May Lindstrom The Problem Solver + Manuka Honey mask. PM: TNB Exfoliating Cleanser, YULI Cocoon Elixir, Odacite Bl+C Serum, Pai Blemish Serum. AM: TNB Cleanser + Konjac, YULI Cocoon, Odacite Bl+C, Pai Blemish Serum. PM: ED4OLO Vitamin B Cleansing Oil, Josh Rosebrook Cleanser, Forest Dew, Pai Blemish Serum + True Nature Botanicals Pacific Balancing Oil. I introduced the Pai Blemish Serum back into my routine here after not being so impressed with it the first time around - it just didn't help my blemishes?! My skin is calming down more and more each day now though and I thought maybe I would see if it helped when my skin was less angry as it's so gentle. I've been trying hard to step back and keep things simple with my skin these past few months. When it's all written down in detail like this it seems a little OTT, but then again there are several times where I really only used the bare minimum. I deserve a medal or something, surely? I love keeping these skincare diaries and seeing what I've used, it's always an eye-opener and I can't believe how fickle I am! Especially comparing the previous posts. Same time, same place next year, yes? Have you ever kept a skincare diary? This is an interesting idea. There are many lovely picks as well! I am a big fan of manuka honey and would love to try Josh Rosebrook, Antonia Burrell, Odacité, and more from YÜLI.